Something that I was never aware of until much later in life was a WWI story about my Great Uncle, Walther Kirchhoff. Walther was a great Wagnerian tenor of the Berlin Opera and wanted to do his bit in the war effort but the Royal House of Hohenzollern thought he was far too precious to send to the front so they appointed him Major and Aide de Camp to Crown Prince Wilhelm of Germany and Prussia. 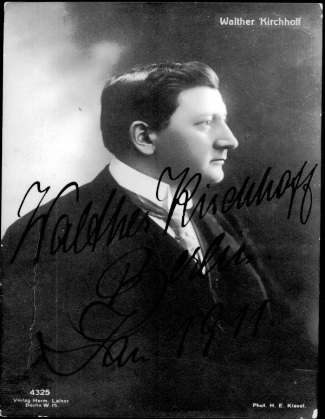 Walther in 1913 had performed at London’s Covent Garden but he had never sung for a French audience. 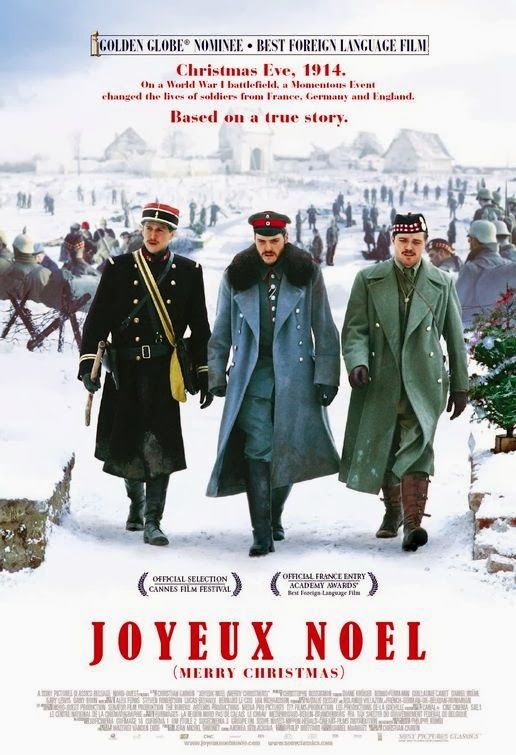 That changed dramatically during the unofficial 1914 Christmas truce on the Western Front during World War I, which has been portrayed in the movie “Le Joyeux Noel”. It was the first Christmas in this terrible war that the soldiers of all sides were away from their families but there was no reason for the soldiers on both sides of the trenches not to be separately singing Christmas carols and bawdy songs. Walther Kirchhoff had encouraged the Crown Prince to deliver to the “field-grey boys” of the 130th Wuerttenberger Regiment, small Christmas trees and candles with which to celebrate Christmas Eve, a traditional German celebration for Christmas. Major Kirchhoff had accompanied German Crown Prince Wilhelm to visit the front and when in the trenches with the soldiers, Walter entertained the Wuerttenbergers singing various German carols with “Silent Night” being the most recognizable on both sides of the trenches. There, his impromptu concert not only drew applause from the Germans but the French and Scottish Regiments on the other side. The Germans had placed their Christmas Trees with candles lit up on the trench parapets and initially the Scots in particular thought it was some form of trap or ambush. When they too responded singing carols in English albeit with a strong Scottish brogue it apparently lessened fears on all sides to the point where officers of the three groups met in the middle of “no man’s land” and arrangedan unofficial truce to celebrate Christmas. This enabled the German, French and Scottish soldiers to mix and mingle and exchange small gifts of a cigarette, a small “schnapps” or whisky, sharing photographs of family and generally appreciating the time out to celebrate the most important event in the Christian calendar. Not only was it a time to mix and mingle but it also gave all sides the opportunity to find and bury their dead. The Crown Prince obviously was well to the rear at some headquarter and Major Kirchhoff stayed with the troops over this period and entertained the combined troops with some splendid arias from many operas and more carols in a hastily arranged concert. During this period, until Boxing Day, men who had been seeking to kill each other for five bloody months refrained from dealing death. Soldiers and politicians had gone into the conflict believing the fighting would be over by Christmas. Instead they found themselves stalemated in cold, muddy trenches on the Western Front dug from the North Sea to the Swiss border. Although top brass on both sides opposed any conciliatory gestures, enlisted men and many lower-level officers — lieutenants, captains and majors — welcomed the respite. A soccer matches in ‘no man’s land’ of the Tommie’s- vs.-Fritzes was held and diaries of the event even gives the scores – which the Germans won. This fraternization and unofficial truce was kept out of the newspapers and the General Staff on all sides, were horrified to think, that officers and soldiers had the initiative and temerity to engage in such a treasonous act. Anecdotal evidence suggests that the Kaiser sent the Wuerttenberger Regiment to the Russian front, the British disbanded the Scottish Regiment and the French were sent to the rear. Even in those days to curtail undesirable news was difficult, and an article of the truce was published in the New York Times on 31 Dec 1914. The British magazine The Graphic, January 1915. Sadly the war lasted for another 4 years with some 10 million military deaths and 7 million civilians. Australia in this terrible conflict lost 61,000 which was a heavy loss considering our population at the time was only 4.9 million. Unfortunately I had never met Walther as he passed away in Germany in 1951 a year after we had immigrated to Australia, but my father and he were very close because both were in the Opera and I heard many a good yarn about Walther who was not only a marvelous tenor but a renowned dilettante. After the war he went on to sing in some of the world’s great opera houses including the Met in New York. His personal life was never the same after the war where his wife ran off with Fritz Reiner the famous conductor the year after the truce in 1915 and he simply immersed himself in wine, women and song. He never however lost his pulling power in the opera and in particular the major Wagnerian roles and he did become the favorite singer of a little mustachioed Corporal who also fought in WWI and became Germany’s nightmare. It is interesting in this the 100th year of the landings at Gallipoli and World War 1 where I may not be able to commemorate any of my relatives or forefathers fighting for the Australians; I can commemorate my Grand Uncle Walther and the short period of sanity and decency that he brought to all who were there through the power of music, the Christian faith and the reverence of Christmas. In a small way I can personally relate to this event through a Christmas cease fire that I and my platoon experienced in the village of Binh Ba in 1966. Unfortunately the enemy didn’t observe the cease fire but it did not stop the platoon in celebrating Christmas Eve Mass with the local Vietnamese ARVN soldiers and their families, providing little gifts for their children, putting together a great Christmas Day meal and being one big family. As historian Andrew Hamilton described the truce of 1914 as “an iconic event, with humanity overcoming man’s innate evil – just for a short time” and we too experienced that in 1966.